Why do French locks 'double' lock, and are any examples of unusual drill pin shapes? Thread: Why do French locks 'double' lock, and are any examples of unusual drill pin shapes? I am interested in antique French locks, especially those fitted to the Necessaire de Voyages. I am particularly interested in why most French locks have the double-locking action. Naturally I would have said that because the locks themselves were relatively simple mechanically (many having only a few levers), a double-locking action would complicate the work of the lock picker, essentially making them have to pick the lock twice. Is there any truth to this? I have seen standard circular and cloverleaf shaped drill pins on these boxes, does anyone have any information on other shapes that were used? 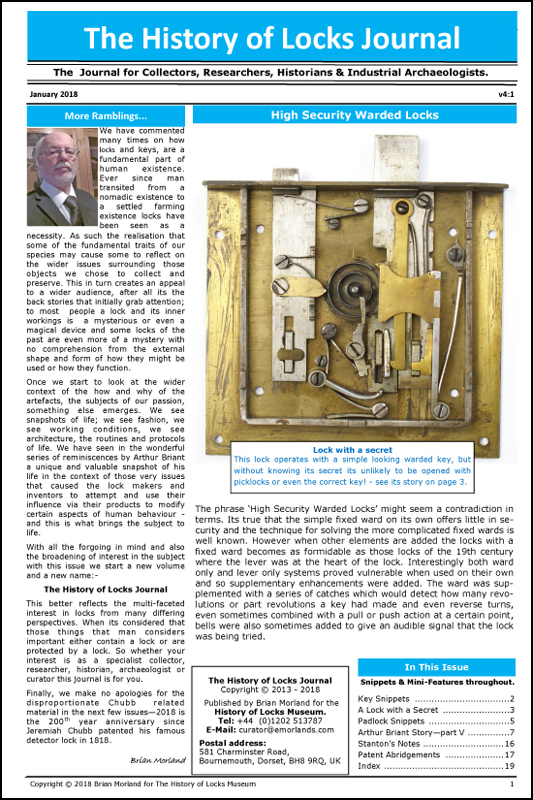 There is a nice feature in the current 'History of Locks Journal' about pre-industrial European locks speculating on how these locks could rival the later high security lever locks. Not only did they have double throw mechanisms but hey also contained other 'secrets' which unless the opening sequence was known they were unlikely to be opened even if you had the correct key. The Key page in the next issue (due out in march) includes some illustrations from Art du Serrurier. Par M. Duhamel du Monceau. M. DCC. LXVII.(1767). This is a french book and is believed to be the earliest wholly on the subject, has just been received back from specialist conservators where it was radiated to neutralize latent fungi in the paper. Pics of a star shaped key and its matching star shaped drill pin. Several of these keys/ locks will be exhibited at the Lock Expo in Nottingham in March 2018. Thank you so much for these images - it is particularly exciting to see the photos of the star and spade shaped drill pins. Do you think there is significance to playing cards here (ie. are there also heart and diamond shaped drill pins?). So the term is 'double-throw'? Do you know of a reason why this feature was included? Some were double throw, some were triple throw. Sometimes the key would have to be turned a number of times and the bolt only shoot on the last turn of the sequence. Possibly there were sequences that were associated with the locksmith, his client or even the lock type. There are quite a number of variants in the collection and amazingly almost as many variations in the action or the sequence; the secret needs to be known even if you have the key - the picklock approach would be very challenging. Regarding the drill pin issue; the shapes do include those typically seen on cards but I'm not aware of any correlation or association. I would be interested if a connection is found, perhaps others know something more concrete in this regard. The double throw ensures a longer bolt throw for the size of the key. One small triple throw lever lock I recently made keys for, required a different key for each throw. And of course it does require extra effort to pick the lever lock a second or third time. With a warded lock, once the pick is made and clears the warding, throwing the bolt a second time would not, generally speaking, add much in difficulty. There could be other possible advantages to a multiple throw lock depending on the design, especially where tricks are involved. One very large European masterpiece trick padlock was featured in the West Coast Lock Collectors Vol. 36, No. 1 that required a total of 12 manipulations to open. Regarding pin shapes, there have been quite a few different ones used, with this one being the most complex seen so far. Interesting this as double or triple throw makes sense on doors or heavy chests to get more travel or extra engagement of the locking bolts, but makes little sense on a Voyage de Necessaire with a single key as Daniel is asking, as they are generally box-type locks with a link plate and studs on the hinged lid? They typically need a small amount of travel to engage securely, so double or triple action seems pretty pointless with a lock operated by a single key unless it is actually doing something additional or trick inside. Doug you made good points on the heavy versions of these locks a while back in another thread, where you said about the matching pierced barrel the key fits being called the 'canon', which I wasn't aware of before. Last edited by Huw Eastwood; 27-12-17 at 10:39 PM. Without good clear pictures of the particular lock in question, it is difficult to say why it would have double throw. If the key itself is quite small relative to the needed throw, that would explain it. I suppose in some cases, tradition may explain a double throw even when it is not needed. Here in the States, where I struggle to think of any double throw locks, a shoe is used on most lever and pin tumbler keylocks to increase throw relative to key size. Here is a photo of one particular French lock, although every French lock I have had has had this same sort of double locking mechanism. If I am understanding this correctly, the bolt which does the catching requires the second throw to extend far enough across to rest under the plate to resist prying. Huw, while I have your attention, I now have job to make the 3 keys for a Perreymond Brevete chest. As near as I can tell, original keys were made from one piece of steel and not soldered together. These chests apparently date to sometime in the 1800's, most estimates being earlier rather than later. Since you have considerably more machining experience, can you explain how this was done, given the time period? The more I look at examples I keep thinking they were done by lost wax casting. What are your thoughts? 2. One full 360 degree anti-clockwise turn of the key. 3. One FURTHER full 360 degree anti-clockwise turn of the key.